“Yet, at this time of great peril, I deeply regret that the British Government seems to be stepping back, rather than stepping up,” writes Shadow Foreign Secretary Douglas Alexander in The Sunday Telegraph, as he juxtaposed the “no room at the inn” of the Nativity with the horrors being meted out on Christians in Nigeria, Syria, Iraq and Sudan. “Just like anti-Semitism or Islamaphobia, anti-Christian persecution must be named for the evil that it is, and challenged systematically by people of faith and of no faith,” he exhorted. And he pledged that an incoming Labour government will establish a Global Envoy for Religious Freedom along with a multifaith advisory council on religious freedom within the Foreign and Commonwealth Office: “Supporting the newly appointed Global Envoy, this will help ensure a strong focus within the Foreign Office,” he assures. And he lauded Baroness Warsi for her commitment to faith and human rights and “the leadership she showed and the seriousness with which she took her responsibilities”, which was, he submits, “widely recognised”. It was a mistake for the Minister for Faith to be “downgraded” from the FCO and for it to become “simply a role” within the Department for Communities and Local Government. None of this conveys any sense of the strong leadership required, he advises, insisting, too, that “this is an issue beyond party politics” (while taking a jaundiced swipe at Eric Pickles and hurling a manifestly warped appraisal of the achievements of Baroness Warsi). The Archbishop of Canterbury was so impressed with this homily that he dared to tweet it out to his 68.3k followers, which caused alarm and dismay to some condescending Tories, as though Justin Welby were being indelicately partisan and unacceptably inattentive to the constitutional constraints of his Office. He didn’t endorse any specific content: all he said was that it was “good debate”, yet this is inexplicably deemed to be “poor judgment by Lambeth Palace” (though the Palace didn’t tweet it: the Archbishop did). We’ve been here before, of course. Last Christmas the tweeting was uncharitably critical of the Archbishop for not being “disciplined” in speaking about Jesus, which was laughably unjustifiable. Justin Welby preaches Jesus before breakfast, before lunch, before tea and before dinner: he doesn’t save the Messiah for Christmas and Easter. This year the admonition is for being naively duped by a clever Labour trap. Good grief, hundreds of thousands of Christians across the Middle East are being systematically raped, tortured, crucified or slaughtered by Islamic Jihadists, and the concern is with petty partisan posturing and which politician really cares most about the expanding holocaust. For the record, as Paul Goodman eloquently points out on ConHome, the idea for a Global Envoy for Religious Freedom was originally a Conservative one. What have they done about it in almost five years of government? A number of senior bishops have written to the FCO a number of times demanding action to help save the many thousands of persecuted and dispossessed Christians. What substantive response has been made? David Cameron delivers fine-sounding speeches about the evil Islamist ideology which threatens centuries of our Christian liberty. What has he done to bolster that liberty? How have his policies aided the Church in defence of religious freedom? Under this so-called Conservative-Liberal-Democratic coalition we have seen Christian couples informed that they may not foster or adopt children; Roman Catholic nurses and midwives coerced into performing abortions; Christian preachers arrested for proclaiming that all have sinned and fall short of the glory of God; Christian employees sacked for displaying crosses; Christian charity volunteers ‘un-volunteered’ for upholding heterosexual marriage; and Christian schools branded ‘extremist’ for failing to inculcate the state doctrine of absolute equality. Of course, Labour won’t repeal any of the malignant legislation which gave rise to this hostile spiritual terrain: indeed, they are mostly responsible for its genesis and propagation. But this un-Conservative, illiberal and undemocratic coalition has equally done little to reinforce freedom of religion as the nexus of civil liberty; nor has it done anything to reassure churches or Christian schools that they may preach and teach in accordance with their traditional beliefs and precepts. Indeed, even under a Conservative prime minister, the assertion remains that to hold an orthodox view of Judæo-Christian morality is to be ‘prejudiced’ and ‘un-Christian’ if not ‘bigoted’ and ‘medieval’. Will a Global Envoy for Religious Freedom do anything to challenge the statist imposition of a postmodern political conception of religious freedom? No, of course not. But Christians aren’t being crucified in Maidenhead or Witney: the terror, torture, mass murder, genocide and ‘religious cleansing’ of Christians is happening in Northern Nigeria, Syria, Iraq, South Sudan and the Central African Republic. The Archbishop of Canterbury has previously called this “evil“. And not only is it evil, but “part of an evil pattern around the world where Christians and other minorities are being killed and persecuted for their faith”. 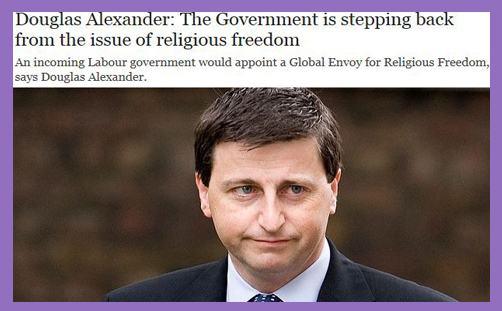 If Douglas Alexander is pledging a future Labour government to confront radical Islam and the malignant Saudi-backed Salafist strain of Jihadism, he should be commended and cheered for defending the freedom of Christians to manifest their religion and belief across the world. You may not believe a word he says or writes: you may think him a political hypocrite, spiritual charlatan or simply a cynical opportunist who has spotted a chink in Cameron’s coming election campaign. The Archbishop of Canterbury cares nothing for this political banality: his heart is with those who are suffering and dying for their faith in Jesus Christ. His prayers are with those who are being persecuted for allegations of heresy, apostasy and infidelity to the inviolable creed of Islamism. Your mind may be on the key marginals; his is on the principalities and powers of the spiritual realm, with a heart inclined toward peace and reconciliation. We have in Justin Welby an Archbishop who knows that the greatest threat to the Judæo-Christian ethic is the Quranic Curtain of the Islamic State. It has descended and stretches from the coastal plains of the Maghreb to the Himalayan peaks of Pakistan. It is inimical to Western notions of politics, religion, morality and enlightenment, to the point that its adherents seek to cleanse the earth of all that impedes its path and obstructs its progress. If Douglas Alexander is promising to confront this evil, he needs upholding in fervent prayer and fully deserves the encouragement of the Archbishop of Canterbury and, indeed, of all Church leaders.